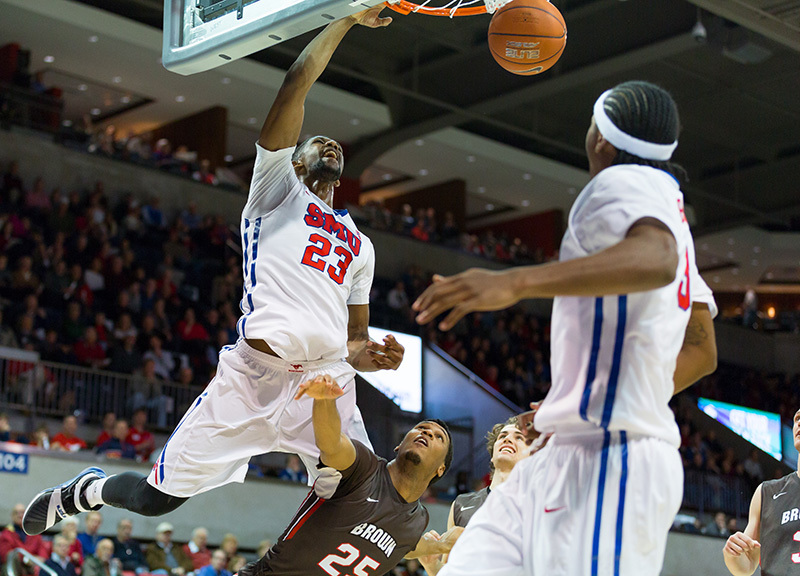 Even Within Its Lost Season, SMU's Men's Basketball Roster Looks Versatile and Dynamic. Now, more than ever before in the Larry Brown era, the Southern Methodist University men's basketball team is having to do more with less. Coming into this season, the Mustangs featured one of the shortest benches of any team in the American Athletic Conference, dressing 12 players as compared to most teams' 14 or 15. Since the first tip-off of the year, that limited roster has been one of this team's major vulnerabilities. Worse, it's an issue that's only exacerbated when team leaders miss games, as was the case against Brown University this past Sunday when the team's two best scorers — senior guard Nic Moore (shoulder injury) and junior forward Ben Moore (unspecified) — were unavailable to play. In their absence, SMU's active rotation featured only eight players, with the team forced to give significant minutes to three freshmen and a walk-on en route to a 77-69 win. In his first major minutes of his collegiate career SMU Mustangs freshman guard Jarrey Foster put up 15 points, seven rebounds and a whole lot defense against Brown University. Jarrey Foster, the player Kennedy complimented, was one of the freshmen forced to play solid minutes in that game, contributing 15 points, seven rebounds and a whole lot of defense to the cause. But, as quickly as Foster has been able to jump in and contribute, his size and athleticism represent a new characteristic of this basketball team, which lost some major size in the front court with the departures of the 6'10″ Canning Cunningham and the 6'11″ Yanick Moreira after last season. More versatile, too. In particular, the team's long guards can and have played every position from a 2 to a 4, as has been the case for the 6'5″ Foster and the 6'6″ junior guard Sterling Brown. They're playing a bit out of position on defense, but it's worked so far with the real big payoff coming on the offensive side of the court. Opposing 4s and 5s are having trouble keeping up with the athletic Foster, Brown and breakout 6'5″ junior guard Keith Frazier. When opponents go smaller to defend those guys, the 6'9″ Kennedy and 6'7″ Jordan Tolbert are generally subbed into the game. This strategy has become one of the team's greatest strengths — so much so that it's even become how the team practices. Everybody guards everybody in practice, Foster says. This tactical shift has allowed a number of players to shine. Freshman point guard Shake Milton has especially stood out in the early part of the season, having played admirably in Nic Moore's absence. At seemingly every opportunity, associate head coach Tim Jankovich praises Milton's high basketball IQ and savvy as such a young player. Freshman point guard Shake Milton has shown a high basketball IQ and savvy this season that's uncharacteristic of most freshman college basketball players. At full strength, as the team was in last night's 75-70 win over TCU, the Mustangs are flush with options. At times, Nic Moore and Milton shared time in the backcourt, wth Moore playing at the 2. With the ball out of his hands, Moore was able to get himself into good shooting positions and put on his best shooting performance of the season, hitting five three pointers and leading the team with 26 points. That combo adds yet more offensive firepower to an already athletic team — multiple times already this season SMU has had four or five players score in the double digits in a game — and should only improve as this resilient, undefeated team goes forward. Furthermore, those prospects will only continue to better as 6'8″ junior Duke transfer Semi Ojeleye joins the team in a few weeks. Unfortunately, even while ranked No. 22 in the current Associate Press polls, this is a team that can't afford to wait too long. With this Mustangs program banned from 2016 postseason play and pride the only trophy it can earn, regular season games are the only ones of consequence. 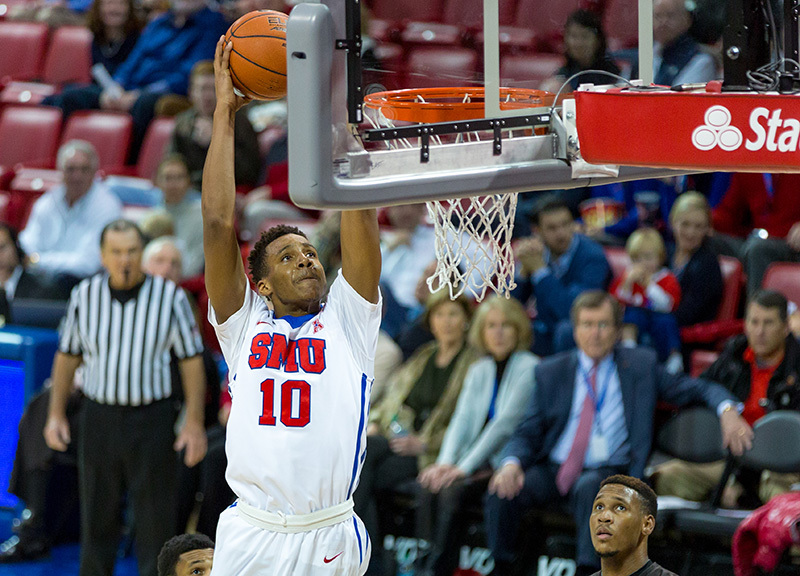 SMU Mustangs forward Jordan Tolbert finishes an alley-oop dunk against Brown that landed him in SportsCenter's Top 10 highlights of the day. Next ArticleThing Of The Past.